A solstice is an astronomical event that occurs twice in a calendar year as the sun reaches its highest or lowest positioning depending on where you live on the planet. In simpler terms, it is the longest day and the shortest day. The summer and winter solstice are celebrated in equal measure across a number of cultures and civilizations so it is great to see the developers at Konami Gaming making the decision to launch a slot marking this significant event. Action Stacked Symbols are Back! Solstice Celebration is a 5 reel, 30 payline slot that is one from the Konami Gaming Action Stacked Symbols catalogue. To explain the Action Stacked Symbols feature, it is where a number of adjacent positions on the reels are outlined by a gold lining. Whatever symbol appears in that gold lining, all other symbols that possess gold lining on that spin will appear as the same symbol. This means that with more matching symbols likely to appear on the reels there is a higher chance of hitting winning combinations. There are a wealth of symbols dotted across the reels on this slot. You will find a diamond, a horse wearing a flowery head dress, butterfly, sun flower, and the regular 9-through-to-Ace symbols. Not sure what the majority of these have to do with the solstice celebrations but we shall take them at face value! The Wild symbol on the reels is represented by the sun itself which is a lot more solstice-related. 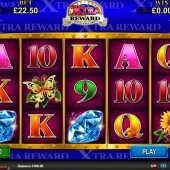 This has the ability to substitute for all of the other symbols on the reels, except for the Bonus symbols, to complete any potential winning combinations. The Bonus symbols are on the reels in the form of the beautiful lady in a summery gold dress. Unfortunately, these Bonus symbols can only fulfil their potential in the Sparkle feature. The Sparkle feature is triggered if you hit two reels or more full of the gold lining symbols. Any symbols with the gold lining are nudged until all positions on that reel have a gold lining on them. All symbols with gold lining on them are then replaced by a Stacked Symbol at random. These include Wilds and the Bonus symbols. The Sparkle feature cannot be re-triggered whilst you are playing it. This is where you can trigger the free spins bonus round. You must hit at least an entire two reels of Stacked Bonus symbols. The two entire reels will earn you 10 free spins. Three complete reels will reward you with 15 free spins. Four filled reels will give you 20 free spins. 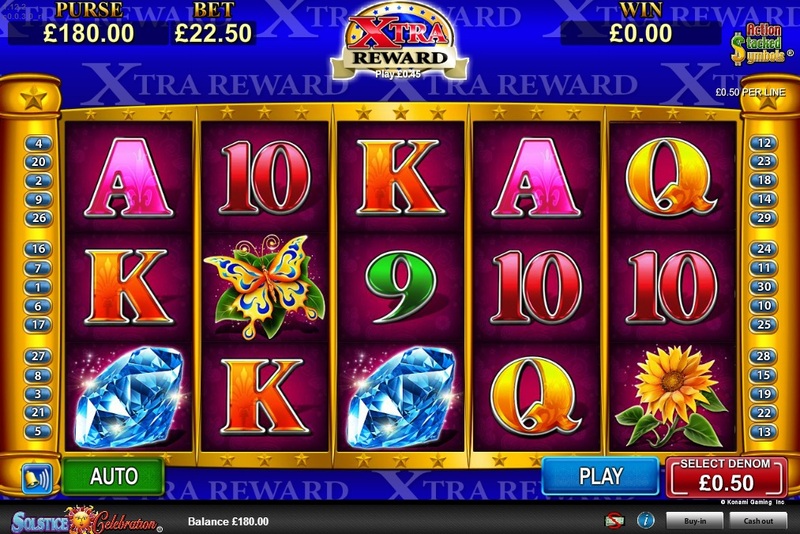 Finally, if you are lucky enough to fill all five reels with Stacked Bonus symbols then you will receive 40 free spins. Also, whenever a Wild symbol appears on the reels during the free spins then it will nudge down until the entire reel is Wild. The Sparkle feature can be triggered during the free spins and from there you can re-trigger the free spins. As always, the prospect of a new Konami Gaming slot excites me. The exotic African Diamond slot and the pure gold China Shores slot both showed the full power of the Action Stacked Symbols feature. Konami has delivered once again. You could argue that the Sparkle feature is a little complex to get to grips with but once you're settled with it you will see its potential. The free spins are potentially lucrative too. Konami continuing as it means to go on with another top class slot title.